1) This paper has been presented as a keynote presentation at the XXIV FIG Congress in Sydney 11-16 April 2010 in the plenary session on The Big Challenges. Mohamed El Sioufi, Ph.D., is head of the Shelter Branch at the United Nations Human Settlements Programme, UN-HABITAT. Handouts of this presentation as a .pdf file. Urban areas occupy only 2.8% of the earth’s surface yet as of 2008 more than 50% of the world’s population inhabits urban areas. Rapid urbanization is occurring largely in developing countries where a massive demographic shift has enormous implications in terms of poverty, natural resources and the environment. The ‘State of the World Cities Report’ published by UN-HABITAT in 2008 projects an average growth of 5 million new urban residents per month in the developing world. In the coming decades, the developing countries will be responsible for 95% of the world’s urban population growth. Levels of urbanization are expected to rise, with the least urbanized regions of Asia and Africa transforming from largely rural societies to predominantly urban regions during the course of this century. By 2050, the urban population of the developing world will be 5.3 billion; Asia alone will host 63% of the world’s urban population, or 3.3 billion people. Population growth and economic development cause drastic changes in land use in many parts of the world and institutional arrangements need serious reforming to ensure sustainable use of the increasingly scarce land resources. This paper will address the issues of climate change and sustainable cities through an international perspective and scientific conceptual framework followed by cities responses to mitigation and adaptation to climate change. The paper will conclude with priority tools identified by the Global Land Tool Network that are needed at country and city level to address climate change challenges. The ecological interaction of cities and their hinterlands is a recurring theme. Rapid urbanization and climate change have given it new impetus and sense of urgency. In 1976, the Habitat conference identified “urban expansion” as a universal development challenge. At the Rio Summit in 1992, the concept of “sustainable human settlements” was introduced. At the Habitat II conference in 1996, the Habitat Agenda highlighted the need for new approaches to planning and managing rapid urban growth thus advancing the notion of “sustainable urbanization”. The world has come a long way on the debate and discourse of these issues. But the challenges are complex and daunting, and require continuous engagement and effort at all levels. The climate change phenomenon is making the issue of sustainable urbanization a matter of urgency. Climate change is now recognized as one of the most pressing global issues of our planet. It is no coincidence that global climate change has become a leading international development issue at the same time as the world has become urbanized. The way we plan, manage, operate and consume energy in our cities will have a critical role in our quest to reverse climate change and its impact. 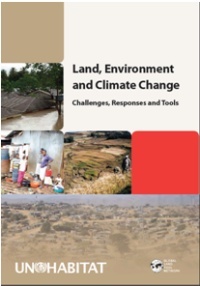 Recently, the Global land Tool Network (GLTN, UN-HABITAT) undertook a study on “Land, Environment and Climate Change: Challenges, Responses and Tools”. The study builds on existing UN-HABITAT work; various researches undertaken in the areas of land, environmental and climate change; and through an e-discussion in 2009. It uses the Driving Force-Pressure-State-Impact-Response (DFPSIR) framework as a basic element of the conceptual framework. It is important to understand the causes behind environmental degradation in order to identify suitable responses. The DFPSIR framework can serve as a simple interdisciplinary starting point. It should then be broadened to capture essential elements of the functioning of socio-environmental systems where institutions guide resource utilization and protect and enhance human welfare. Property rights are core determinants for how land resources are utilized and their welfare effects are distributed. Similarly, the degree of market development for natural resources as inputs in production and as essential elements of livelihoods and safety nets for current and future generations determine the need for complementary non-market institutions and regulations where markets do not work properly. Driving Forces are underlying in form of population growth, technology and changes, institutional (political, market, cultural, social), structures, and changes. Land laws and markets affect land resources through how they impact on land management. There are typically nested interactions among these driving forces. Pressures from the driving forces have direct impacts on the environment. These include forest clearing for agricultural production, city growth on agricultural land, or pollution of land, water and air from industrial, and other human activities. Pressures emerge from the incentive structures created by the driving forces. The State of the Environment can be captured by assessing the stock of natural resources, changes in them or environmental quality indicators like, erosion levels, nutrient stocks, soil quality, pollution levels, changes in areas or quantities of carbon, and loss of species or habitats. Global warming due to GHG emissions causes changes in air and water temperatures, sea level rise and severity of storms, floods, and droughts. 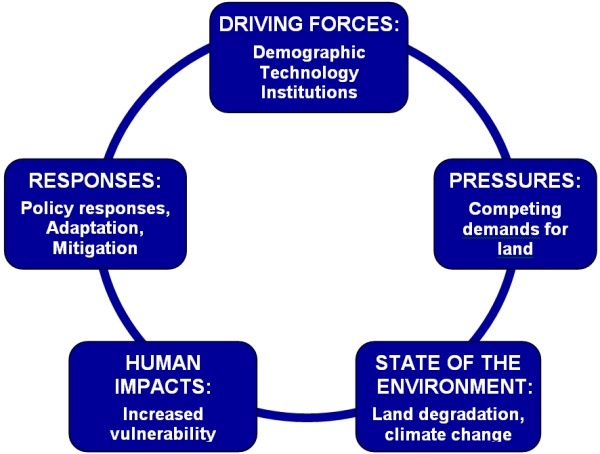 Human Impacts of the changes in the environment are measured through a range of indicators, like poverty status, food security or other measures of vulnerability, access to land and resources, tenure security, market access, access to shelter and other basic human needs, access to safety nets, and the degree of empowerment or political influence. At aggregate level these are related to the Millennium Development Goals. Responses include responses at local, national and international levels. They can address the Driving Forces, the Pressures, the Environment or Human Well-being. The time perspective may also vary from short- to long-term. Urban areas also have several of the same types of land-related environmental problems with soil, water and air pollution as the most severe urban problems in many developing countries. The severity of these land-related environmental problems varies greatly across locations and so does the vulnerability of the people living in the different locations to the effects of these environmental problems. The severity of the effects can also be delayed till certain threshold levels of degradation or accumulation have been passed and may therefore be ignored or underestimated by current populations while future generations will be badly affected. This is particularly the case for global warming where those who have caused the problem are more able to protect themselves than those who are most severely affected by climate shocks and sea level rise due to climate change. Increasing land fragmentation in densely populated areas. Unsustainable management including increased activity in land rental markets and short-term strategies on rented land. Threat by elite capture undermining land reforms. International efforts are important to enhance the transparency and accountability in situations where the poor loose out. Tenure insecurity undermining investment and leading to environmental mismanagement in urban and rural areas. Increasing pressures on customary tenure systems that are in need of revisions. Only 30% of plots are registered in developing countries and 2-3% of the land is owned by women in Sub-Saharan Africa. The continuum of land rights proposed by the GLTN is an important milestone in addressing tenure security issues. Encroachment of agriculture in particularly vulnerable and valuable habitats. Deforestation and forest degradation leading to carbon emissions, loss of biodiversity and mud slides. Sharp increases in demands for land for food and bio-fuel production displacing the poor. Seventy-five percent of commercial energy is consumed in urban and peri-urban areas. In addition, 80% of all waste is generated from our cities and up to 60% of Greenhouse Gas Emissions which cause global climate change emanate from cities. Recent large-scale land deals in Africa and Asia in response to rising biofuel demand and resulting food price increases is an area where international organizations can help poor countries and local people in the negotiations to develop contracts that protect their interests. Establishing better standards for transparency and accountability and increased international pressures and support to implement such standards will be important to reduce levels of corruption and elite capture. Increasing threats in coastal areas due to sea water rise and severe weather risk. There have been recently warnings that the sea level is rising twice as fast as was forecasted, threatening hundreds of millions of people living in deltas, low-lying areas and small island states. But the threat of sea-level rise to cities is only one piece of the puzzle. More extreme weather patterns such as intense storms are another. Tropical cyclones and storms, in the past two years alone, have affected some 120 million people around the world, mostly in developing and least developed countries. Indeed, in some parts of the world, inland flooding is occurring more often and on a more intense basis. We are witnessing more frequent flooding and drought in the same year, causing heavy impact on food security, energy and water supply. This is practically daily occurrence for many of the world’s less fortunate people who live in life-threatening slums. For them, the climate is already out of control and, perhaps equally important, out of comprehension. The impacts of climate change will be felt strongly in the years to come. If sea levels rise by just one meter, many major coastal cities will be under threat: Buenos Aires, Rio de Janeiro, Los Angeles, New York, Lagos, Alexandria, Egypt, Mumbai, Kolkata, Dhaka, Shanghai, Osaka-Kobe and Tokyo, just to mention some mega cities that are under imminent threat. The many smaller coastal cities, especially those in developing countries and those of small island nations will suffer most due to their limited adaptation options. More and more people are drawn to the urban magnet. In many parts of the world, climate refugees from rural areas that have been hit by drought or flooding aggravate the migration to cities. Those parts of the population who already suffer from poor health conditions, unemployment or social exclusion are rendered more vulnerable to the effects of climate change and tend to migrate to cities within or outside their countries. The UN predicts that there will be millions of environmental migrants by 2020, and climate change is one of the major drivers. Therefore, there is no doubt that climate change exacerbates existing social, economic and environmental problems, while bringing on new challenges. The most affected today, and in future, will be the world’s urban poor – and chief among them, the estimated 1 billion slum dwellers. Our studies have identified important research gaps and key research questions related to land, environment and climate change challenges, seeking to explore ways to empower all who are working in these areas to overcome them. It is crucial to recognize that cities and urban residents are not just victims of climate change but also as part of the problem. If cities are part of the problem, that means they must also be part of any solution. Mitigation measures are urgently required. However, and to date, the measures envisaged globally and nationally have yet to be accompanied by concerted measures at the city and local levels. While we fine-tune carbon trading instruments, we need to take immediate actions to make our cities more sustainable by revisiting our land-use plans, our transport modalities, and our building designs. There is a unique opportunity to bridge our global efforts in emissions control with local efforts to improve the quality of life and the productivity of our cities. Our cities are, after all, the driving force of our economies, and what better measures can be take than to reduce traffic congestion, improve air and water quality, and reduce our ecological footprint. In this regard, urban density is a key factor. A recent survey indicated that in New York City, per capita greenhouse gas emissions are among the lowest in the United States. This is because less energy is needed to heat, light, cool and fuel buildings in this compact city where more than 70 percent of the population commutes by public transit. The city of Atlanta in the USA and Barcelona Spain, for example, both have a population of about 2.5 million. Atlanta currently occupies an area of 4200 sq km whereas Barcelona occupies only 162 sq km. Atlanta consumes much more energy due to its urban form and higher per capita energy consumption. Climate change mitigation can be a good business opportunity. Clean, low-carbon infrastructure investments, retrofitting of buildings, the renewal of our transport systems are opportunities for ‘green’ investments. According to the estimates of international associations of local governments, already 2800 cities have committed themselves to reducing their annual GHG emissions, or meeting other targets for more sustainable urban development. While most of these cities are in the Global North, others in the South are taking specific measures taken to reduce urban emissions include construction of an urban wastewater methane gas capture project, undertaken in Santa Cruz (Bolivia); energy efficiency audits of municipal buildings by Cape Town (South Africa); and development of rapid transport systems and other measures designed to reduce the use of single occupancy vehicles in a number of cities. At the same time, there is rising consensus that cities must take immediate adaptation measures to reduce vulnerability. Here again, we have yet to recognize the need to plan our cities and settlements to prevent loss and destruction of lives and properties. The time to act is now and the place to act is in the cities of the world. Cities not only have to take preventative measure, they must plan to offset the worst. In this respect, there is no doubt that local authorities will be the front line actors in finding local answers to these global challenges. There is no one-size fit all solutions and each local authority will have to assess its own risks and vulnerability and plan accordingly. It is obvious that local authorities, especially secondary cities in developing countries that are growing the fastest, will be the most severely tested by these challenges. These cities, despite their rapid growth, contribute a minimal share to global greenhouse gas emissions. Yet they are the cities that are most at risk in terms of suffering the impacts of climate change. Cities can adapt to the impacts of climate change via effective urban management. 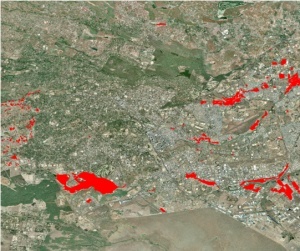 Planning and land use controls can prevent people from building in zones at risk of flooding and landslides (e.g., restrictions on building within 50 year floodplains in South Africa). Guidelines and regulations, such as a decision issued by the Thua Thien Hue provincial authorities in Vietnam to encourage cyclone-resistant building practices, can increase resiliency and make economic sense. However, we also know that many cities in Least Developed Countries do not have much urban infrastructure assets that can be adapted. Therefore, adaptation can not be disconnected from the need for local development. Both adaptation and mitigation strategies in urban areas require new and improved infrastructure and basic services. This provides cities in developed and developing countries with unique opportunities to redress existing deficiencies in housing, urban infrastructure and services and to create jobs and a new opportunities to stimulate the urban economy. The resolve with which the cities stuck to their climate action despite the current economic crisis was very reassuring. They remain convinced that climate change action makes economic sense. For example, increased energy efficiency is not only good for the climate but also makes sense for a city's budget. As former president Bill Clinton said: "For every 1 billion US dollars invested in the retrofitting of houses to increase their energy efficiency, 6000 jobs are created. This is six times bigger in impact than in average public investments. And what is more: savings in energy will pay back for this investment in just over 7 years". The technologies are there. The solutions exist. They range from water harvesting to solar energy, and from affordable mass transit to bio-fuel production. But turning the huge unmet needs into market demand requires the right mix of political will and commitment, well-founded policies and strategies, an enabling business environment and capacity development. It is in this context and in response to these challenges that UN-Habitat has launched the Cities in Climate Change Initiative. This initiative is supporting the efforts of government agencies and local authorities in adopting more holistic and participatory approaches to urban environmental planning and management, and the harnessing of ecologically sound technologies. The Initiative uses adaptation as a starting point to engage people, their local authorities and the private sector in risk abatement action. This starting point leads to mitigation. Here, the Cities in Climate Change Initiative argues that the measures required for adaptation and mitigation are the same, namely better land use planning, better urban management, more participatory governance focusing on more resilient housing and smarter infrastructure and basic services. The Cities in Climate Change Initiative has started off last year in four pilot countries of Mozambique, Uganda, Philippines and Ecuador. It has since expanded to cities in Burkina Faso, Kenya, Namibia, Rwanda and Senegal. We are currently starting assessments in several Asian countries and we are fundraising to respond to the strong interest from Small Island Developing States in the Pacific and the Caribbean. UN-HABITAT provides capacity building support and helps ensure the sharing and transfer of knowledge and lessons learned from experience. We have received new mandates by our Governing Council to support cities in addressing Climate Change more forcefully. In partnership with the Cities Alliance, the World Bank and the United Nations Environment Programme, UN-Habitat is refining methods to support cities to measure their climate footprint and assess their climate change vulnerability. These metrics should assist cities in accessing climate related finance. To focus more on land and climate change issues, UN-HABITAT has participated in the setting up of a Global Land Tool Network (GLTN) and assuming the role of technical secretariat for the Network. GLTN includes an international partnership of key actors on land. Many of you are already members in this network through your professional organizations including FIG, UN sister agencies such as FAO. UN-HABITAT are among other prominent actors including development IFIs such as the WB; Donors (Sida and Norway); technical agencies (GTZ); INGOs (the Huairou Commission, SDI, Hajimani); academia (Harvard University, University of East London); and others. The rich variety of complementing partners in the network illustrate a maturity and realization of all of us acknowledging the need to cross our specialized boundaries in a quest to better define and understand the issues on the ground as well as to jointly agree on priority gaps to be addressed to better guide us all in our work. The GLTN together with our other programmes focus on issues related to cities and urban areas. Issues identified include land and governance with FAO; gender valuation with the Huairou Commission and FIG; Social Tenure Domain Model (STDM) with FIG, ITC and WB; Land Tenure and Natural Resource Governance in Africa with US-Aid and development partners in Kenya; Development of Natural Disaster Guidelines on Land - Land issues with humanitarian partners; and Land, Environment and Climate Change: Challenges, Responses and Tools- together with a Norwegian Research Institution. Land tenure reform: Land reform requires thorough analysis of each country’s specific situation and must be widely agreed upon by various interest groups in the land sector. Taxing of land values was identified as a crucial instrument to mobilize idle land and make it available to more efficient and needy users. However, even though introducing such a tax system seems an optimal solution, there can be strong political constraints as it is likely to be opposed by landowners and the elite. The best strategy would be to look at the range of land relation taxation solutions. In a broader urban perspective on policies and tools there are many examples of innovative, pragmatic and cost effective policies to improve access, land tenure security and property rights for the urban poor. Information on these is already in the public domain. Regulation of land markets to enhance sustainable land use: land market regulations have been and are still common in many countries. Concerns about environmental consequences may call for regulation of land rental markets, [for example when] rental contracts are of short duration. Short-duration contracts can suppress investment incentives, leading to non-sustainable land management practices. Land management, administration and information: accessible to all in a transparent way with focus on climate change mitigation and adaptation issues. Slum rehabilitation and resettlement including provision of tenure security in urban slums. Forced displacement of slum dwellers without adequate alternatives, resettlement options or compensations is the recipe for further social, economic and environment losses. Displaced urban dwellers tend to resettle on more marginal and vulnerable sites. Their source of and access to livelihoods are often severely undermined. Upgrading and reconstructing degraded urban environments such as slums is crucial in combination with providing good alternative resettlement areas. Development of low-cost and incremental approaches is key due to the budgetary restrictions and the large and growing number of slum dwellers. More importantly, preventing and containing slum growth, especially on vulnerable landscapes would provide long-term gains. Land law, regulation and enforcement: land laws are crucial tools for enhancing more sustainable land use. However, land laws can also be ‘toothless’ unless enforced. Development of improved land laws needs parallel dissemination of information about the content of the laws in the land administration system as well as other parts of national and local administrations that have an influence on land use (e.g. Ministries and Departments of energy, forestry, agriculture, transportation, and planning). Furthermore, the public and land users themselves need to be informed. Universities and relevant education programs, research institutions, land user organizations, NGOs, and large private enterprises are all organizations that should help disseminate such information. In developing countries with poor information access and low levels of literacy, it takes years before the contents of new land laws reach land users, if ever, before new laws are passed. The language of the laws is hard to understand for people with limited formal education. The new laws have to be translated into local languages before being disseminated. Popular formats conveying the essence of the law may be more suitable for dissemination than direct translations. Payment for environmental services: Design of Payment for Environmental Service (PES) schemes as a way to create markets for resources that are threatened by degradation and consequently also for their maintenance and improvement, can become important policy tools in the future. However, this requires innovative designs and careful pilot testing before they are scaled up. The poverty of land users and the poverty reduction effects of PES schemes will be important design considerations. Payment for resource dividends: A progressive land and resource dividend system, if introduced, may mobilize idle land from large land and resource owners for more efficient use in countries with unequal land and resource distribution. However, to succeed it is crucial to frame such a dividend system in a palatable way to build sufficient public support for its introduction. GLTN can take a leading role in piloting and promoting the use and scaling up of such land tools. Participatory public works programs / productive safety nets and as means to invest in environmental conservation: rehabilitation and conservation of community facilities (e.g., roads, drainage networks, waste disposal systems, etc) can be undertaken using food for work or cash for work program. These can not only help healthy and better serviced neighborhoods, but also create opportunities for gainful employment. Collective action for enhancement of environmental services: [Formal and public sector based] Law, regulations and law enforcement mechanisms are not enough in most countries. More important is consolidated and coordinated action for ensuring quality and standard of urban environmental services. A strong urban environment monitoring agency is essential. An independent, powerful and capable urban environment protection force can be established. Integrated rural and urban development: rural development and urban development are closely linked through migration, flow of resources, economic empowerment, commodities and services. The problem of expanding slums cannot therefore be seen as exclusively an urban problem as they are largely filled by immigrants from rural areas. Slums may be compared to a leaking boat: new migrants flow in as earlier slum dwellers are rehabilitated or moved elsewhere. The problem can only be tackled at a broader scale requiring both rural and urban development. Providing tenure security and slum rehabilitation: Increasing populations in urban areas makes is making it difficult to provide shelter and security of tenure for urban dwellers, especially for the poor and other vulnerable groups. Poorly managed rapid urban population growth in developing countries often leads to a rapid growth of slums and increasing environmental health problems. Severe environmental degradation is one of the common features in developing country cities. Insecure tenure in informal (often illegal) settlements makes it also unattractive for poor households to invest in improving their temporary housing arrangements and adopt sustainable environmental practices. Conventional titling programs in such urban areas have often failed to solve many of the basic problems and may have forced poor slum dwellers to relocate in environmentally risk-prone and hazardous locations, further exposing them to natural disasters. It appears that legal pluralism is preferable, combining ownership-based and rights-based approaches while taking into account the needs of the poor, their financial constraints and the limited capacity of urban land administrations. This also implies a continuum of land rights, including freehold tenure, leasing arrangements, public ownership, group tenure, and informal tenure arrangements (Payne et al., 2008). Provision of temporary occupational licenses, group ownership by community land trusts, and company or co-operative ownership and subdivision of land to members in Kenya. Simple documentation of informal settlements in Egypt. Cooperative housing in South Africa. Provision of Certificate of Rights to use and develop state owned land in Botswana. Temporary land rental in Thailand. Recognition of illegal settlements in Indonesia. Relocation of illegal settlers by providing land titles on nearby land in Cambodia. Provision of registered leaseholds in squatter settlements in Brazil. Formal landlord-tenant property contracts in Bolivia (Dey et al., 2006). Rescue plans for areas threatened by sea level rise and storm floods: Particularly vulnerable areas with large poor populations that are unable to protect themselves against sea level rise and storm floods need international and national support. Whether it is most appropriate to invest to protect their current livelihoods or to organize resettlement in safer locations depend on the relative costs of the alternative solutions. This will depend on the expected size of the necessary protective barriers that have to be built for protection, the distance to available alternative locations for resettlement, the size of the population, costs of building suitable resettlements, etc. A long-term plan for gradual resettlement is preferable to an after-disaster resettlement. The latter will be more chaotic and will involve severe losses. In relation to such planned gradual resettlement, there are important property rights issues to be resolved. The property value of the properties lost may fall significantly but there is also a risk that evacuated areas and houses are likely to be occupied by opportunistic settlers. …. The financial costs will be very high and clearly beyond what poor affected populations, communities, cities and countries can afford. Since the cause of the problem is also global, it is necessary to develop an international system for funding of such large-scale operations. This is an area where UN agencies could play an important role. Support will also be needed for building professional capacity to tackle such large resettlement schemes. Organizing a network of professional staff from threatened countries and cities is an important first step. To meet the Millennium Development Goal (MDG) goal 7, target 11 to have achieved a significant improvement in the lives of at least 100 million slum dwellers by 2020, is a central concern of UN-HABITAT. This target must be seen in connection with the factors causing rapid inflow of new migrants as well as the fact that some of these areas are in coastal zones that are threatened by sea water rise and weather risk. Rural development and land reforms in rural areas can contribute to reduce the inflow of people and therefore be an important part of the solution. Similarly, rural development can be seen as one of the means of alleviating poverty and increasing incomes for both rural and urban people. At the same time it must be an international responsibility, particularly for the countries that have contributed most to carbon emissions to provide funds for adequate compensation and alternative livelihoods for the people that are threatened by sea water rise, drought or flooding due to climate change. UN agencies can continue to take a leading role in the planning of strategies to tackle this problem. The world is at a cross roads; the fight to combat poverty and climate change is to be won or lost in our cities. Cities, as much as they embody the challenges also offer the solutions. The hundreds of communities and cities whom we recognize for their good practices symbolize this potential. The challenge is that many cities in the developing world are not endowed with the capacity to harness and mobilize knowledge. A sustainable city must be a learning city which is continuously exploring and innovating, sharing and networking. Universities and knowledge centres have much to contribute to this endeavour. Universities bring their knowledge and expertise, whilst cities offer them unique opportunities to link research and education with policy and practice. Recognizing this potential, UN-HABITAT, has recently launched the World Urban Campaign to harness and channel knowledge, expertise and experience in support of sustainable urbanisation. Finally, the challenges facing cities with regard to climate change are numerous and daunting, and no entity, public or private, governmental or non-governmental, academic or practitioner, can face these challenges alone. All those who are committed to turning ideas into action are invited to join UN-HABITAT and its partners in the quest for more sustainable urban development. Dr. Mohamed El-Sioufi is the Head of the Shelter Branch in UN-HABITAT. He has 32 years of experience in architecture, housing and urban planning. His experience bridges professional practice, academia, research, training and technical advice. He has worked for UN-HABITAT since 1995 in training and capacity building, policy and technical cooperation and the development of global norms and guidelines. His experience in human settlement spans a variety of specialized fields including capacity building in sustainable urban development including historic cores, housing policy and strategies, slum upgrading, climate change mitigation through sustainable building materials and construction technologies, post disaster rehabilitation, environmental planning and management.